The traditional Nuu-chah-nulth system offers an enlightening alternative to an industrial economy that has often undermined community and environmental stability in the name of corporate profit. "The industrial age has come and gone in Clayoquot Sound, a blip on the historical map of the rain forests of home. "The promise of prosperity and stability offered by industrial fishing and forestry suddenly went broke on all accounts: economic, cultural, social, and ecological. The number and wage level of jobs declined for three decades, native culture endured a century of denigration and decline, local communities lost their self confidence, and the availability of salmon, herring, groundfish, shellfish and timber all plunged. "Twenty years of struggle, unprecedented civil disobedience, an incalculable amount of local and provincial energy spent on analysis and debate — these have all been signs of transition. The future of Clayoquot Sound — as with many other communities in the coastal temperate rain forests of the Pacific Northwest — lies in its past. The transition taking place today is away from a narrow dependency on the forest products industry and its cycle of resource depletion and declining employment. The shift is back to an economy of abundance based on the richness of the sea, of the tidelands, the rivers and — to a much lesser degree — the forests." Seeing the Ocean through the Trees examines the practices, decisions and events leading up to the 1993 summer of protest that resulted in the arrest of over 800 people and the largest mass trial in Canadian history. Then, building upon the recommendations of the Scientific Panel for Sustainable Forestry Practices in Clayoquot Sound, it charts a new direction for the region, one in which economic development conserves both natural and cultural values. Redraw Clayoquot Sound's administrative boundaries to coincide with watershed boundaries, thus reflecting natural processes. Remove existing tree farm licenses and fishing boundaries in favor of locally developed forestry and fishing management plans. Build a new institutional capacity to manage all activities in Clayoquot Sound according to ecological principles and drawing upon Nuu-chah-nulth traditions. Expeditiously settle Nuu-chah-nulth treaty claims. Establish an independent scientific body to ensure proper implementation of the recommendations of the Scientific Panel for Sustainable Forestry Practices in Clayoquot Sound. Establish a blue-ribbon scientific panel (similar to the scientific panel on forestry) to study and make recommendations regarding the management of Clayoquot Sound's marine ecosystems and marine resource base. 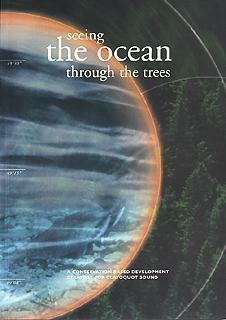 Mapping the Scientific Panel's Watershed-based Recommendations, an excerpt from Seeing the Ocean through the Trees, is available on Inforain and includes ten full-color maps originally published in the book.